Stepping off the plane in Thailand, you’re transported to an idyllic paradise of luscious beaches, warm sunshine and rich green landscapes. If you’re looking for an exotic holiday with a touch of luxury in 2019, Thailand has it all. A historic country with a diverse culture, welcoming people and multitude of wonderful attractions, Thailand is one of the most popular South-East Asian holiday destinations. From encounters with majestic elephants to exploring thick forests, Thailand boasts natural beauty that few places on earth can rival, and it has plenty of affordable, tourist-friendly attractions too. Whether you’re looking for the right destination for your family holidays, a romantic getaway with your significant other or are taking the plunge and looking to do some travelling, Thailand has something for everyone. There’s an almost endless list of things to do on your Thailand holiday, owing to its status as a thriving tourist destination for holidaymakers from across the globe. Some of the top attractions in Thailand are the floating markets, which take place in Damnoen Saduak and Amphawa on boats. Here you’ll find vegetables, fruits and exotic local delicacies such as deep-fried sweet dough and squid. If you’re feeling adventurous, many vendors let you try a sample before you buy so you can expand your culinary horizon, as well as your cultural one. You may have seen them in pictures, but nothing prepares you for the sight of the majestic limestone rock formations at Ao Phang Nga National Park. At the popular Elephant Hills attractions in Khao Sok National Park, you can make friends with Asian elephants in a safe environment with professional tour guides. At the grounds of the Grand Palace at Bangkok, you’ll find Wat Phra Kaew, the most renowned temple in Thailand. The temple is home to a stunning Emerald Buddha, named Kaew Morakot, which was painstakingly crafted from one piece of jade by hand. Thailand is of course renowned for its spirituality, so what better place to learn the art of meditation with Buddhist monks at the monastery of Chiang Mai? Thailand’s cuisine is every bit as vibrant and colourful as its stunning natural surroundings. Thai cuisine is famous for fresh ingredients, bold flavours and clever contrasts of texture. The staple elements of Thai cuisine include rice, noodles, soup, seafood and spices. Perhaps the most famous dish of Thai cuisine is the Phat Thai, a vermicelli stir fry dish with tofu, shrimp, egg, fish sauce and spices including chili and vinegar. Another popular dish is Tom Yam soup, otherwise known as sour Thai soup, which is most popularly in shrimp flavour. Thailand’s north eastern region is embodied its laap (also known as larb or larp), a type of minced meat with rice powder, lime juice, fresh herbs and fish sauce. Rice is a typical ingredient in many Thai dishes and is enjoyed fried as a kind of comfort food, often with large chunks of egg and crab. While many people think of Thailand as attracting mostly teenage and twenty-something backpackers, solo travellers and couples, there’s plenty of family-friendly activities here to keep people of all ages happy. Thailand’s natural beauty and warm weather make the ideal setting for outdoor activities with your loved ones, from playing sports and running on the beach to sightseeing ancient templates and browsing floating boat markets. As with much of Asia, Thai culture is rich in cute cartoons and attractions including elephants and costumed street performers to entertain your little ones. 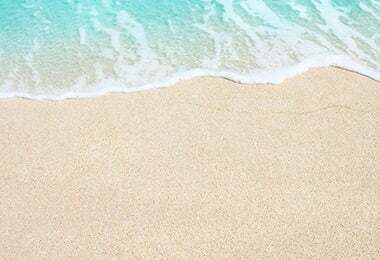 Some of the best regions in Thailand for families include the Eastern Seaboard and Ko Chang, which have a number of gently sloping beaches and shallow sea waters that are ideal for young children. Older kids and teenagers will also like bathing and tending to majestic elephants, kayaking in the mangroves and exploring the inner jungle. Phuket has a multitude of amusement arcades, shops and entertainment venues that all the family will enjoy. If you’re no stranger to action and adventure, you’ll love Thailand. The spectacular natural beauty of Thailand makes for some unforgettable outdoor activities, whatever your taste in sports and activities. As you’d expect from a country with a large expanse of scenic coastline and sun-drenched weather, water sports are one of the big draws here for active holidaymakers. The country’s picturesque coastline and clear waters only add to the appeal. The most popular water sports here are diving and snorkelling, with a whole underwater world waiting to be explored. Here you can come face to face with majestic sharks and friendly turtles, as well as spectacular underwater landscapes. You’re spoilt for choice when it comes to water sport schools and hire shops in Thailand, so you can really dive in whether you’re a water sports novice or seasoned pro. If you’d prefer to stay inland, you can still have fun on the water with a water-rafting experience. For those who prefer to keep their feet firmly on dry land, you may prefer to try hiking, climbing or cycling. A holiday in Thailand gives you the opportunity to explore two striking coastlines, both dotted with idyllic tropical islands and tranquil beaches. Thailand is a dream for those who like to travel between islands, with backpackers venturing here from all over the world to make their way around Koh Samui, Koh Phangan and Koh Tao. To the west you’ll find Phi Phi Island and a series of picturesque inlets off Krabi. Krabi itself is famous for being home to a number of scenic beaches, but it’s not just beach-bums that are kept entertained here, as there’s also a bustling rock climbing scene. On the western coast is Khao Lak, which was formerly a group of traditional fishing villages which have evolved into a beach haven for tourists. 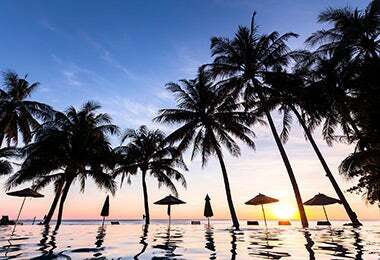 All in all, the diversity of beaches and resorts in Thailand makes it ideal for beach-lovers everywhere. Thailand is famous for its buzzing nightlife scene, which is particularly popular with younger holidaymakers and backpackers. The nightlife here has a laid-back atmosphere with an emphasis on affordability, and plenty of gimmicks like laser lights and themed evenings. If you like to party you’ll love Thailand, with plenty of nightclubs, bars and restaurants catering to those who like to live it up both on the islands and in the city areas. Bangkok has so much to offer for night-dwellers, with the world-famous Khao San road playing host to a number of unforgettable bars, clubs and restaurants. The more isolated islands like Phi Phi and the group located off the east coast are synonymous with partying, with Koh Phangan reaching iconic status thanks to its bustling, somewhat raunchy Full Moon Party. The island hosts backpacker parties on the full moon of each month, resulting in a fun, yet organised sense of chaos. For an unforgettable party experience, head to Phuket, the country’s main entertainment destination. You’ll need to keep an open mind with Phuket as you’ll find everything from discos and nightclubs to cabaret shows and go-go bars here, as well as the usual live bands and touring international DJs. With breath-taking scenery, idyllic beaches and a vibrant, welcoming atmosphere, there’s a lot to love about Thailand as a romantic holiday destination. The stunning coastline is a real magnet for holidaying couples looking to relax and unwind, whether you’re toasting a special anniversary or are just looking to spend quality time together. Around Phuket you’ll find a number of excellent resorts and hotels, many of which make good use of a beachfront location to give you the ultimate in tropical relaxation. Krabi is a good choice for couples that love to take boat trips and explore the coastline, with a number of dramatic karst islands, secret lagoons and isolated coves that give you a sense of being in your own romantic tropical paradise. 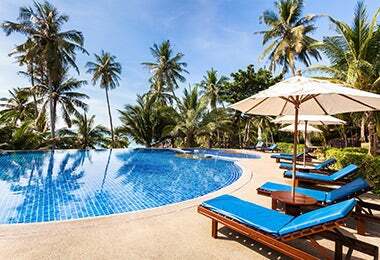 Around the capital city you can escape to the beach resort at Hua Hin to take time out from the bustle of city life, offering a nicely balanced holiday that isn’t too active or too laid-back. Pai is another very popular Thailand holiday destination for couples, with its close proximity to Chiang Mai and mood-boosting bohemian ambience. The countryside around Pai is particularly stunning, with a plethora of mountainous landscapes, rushing rivers and spectacular waterfalls. Thailand is located between Cambodia, Laos and Myanmar, with the Gulf of Thailand to the south, giving its culture a uniquely diverse feel and ambience. Thanks to its varied geography and welcoming native population, Thailand really is the ‘Land of a Thousand Smiles’ and is considered one of the must-see locations of South East Asia. In the north of Thailand you’ll find plenty of dense forests and winding river valleys, with a culture that is more influenced by Burmese culture. Some of the most culturally enriching attractions you can visit in Thailand include the boat-based floating markets at Amphawa and Damnoen, Bangkok’s Grand Palace and the Temple of Wat Phra Kaew, with its iconic Emerald Buddha. Thailand hosts a number of vibrant festivals throughout the year including Thai New Year in April, which is honoured with a three-day Songkran Festival and hilarious water fights. Each February Chiang Mai comes to life during the Flower Festival, with spectacular displays of flower-adorned boats and a number of agricultural attractions.